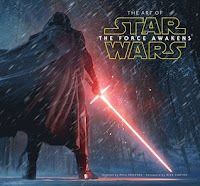 The Art of Star Wars - The Force Awakens is a gorgeous coffee table book. I like it better than the book for the second movie, because it offers more interesting material and is laid out in a chronological manner. Unlike The Last Jedi, in which all the images are instantly recognisable from the final movie, this book shows a lot of material that didn't make it into the film, and it is fascinating to see how the characters and plot developed and changed during pre-production.